As one of the most visible programs of the Texas Historical Commission (THC), historical markers commemorate diverse topics in Texas history, including: the history and architecture of houses, commercial and public buildings, religious congregations, and military sites; events that changed the course of local and state history; and individuals who have made lasting contributions to our state, community organizations, and businesses. 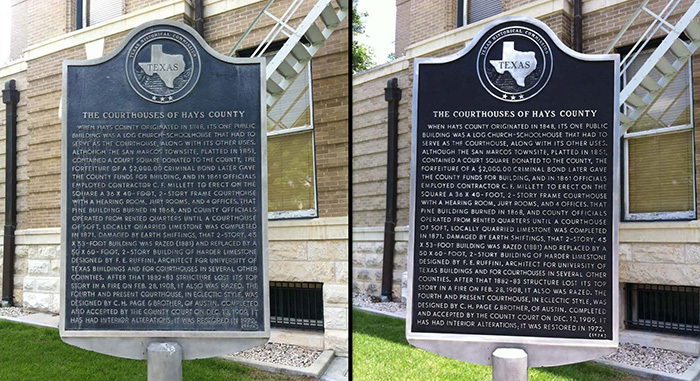 Historical markers can be found in all 254 Texas counties. Age, significance, and architectural requirements govern the eligibility of topics and sites when applying for either a subject marker, Historic Texas Cemetery marker, or a Recorded Texas Historic Landmark marker. New historical marker Google maps! Check out the new thematic historical marker maps through Google. The maps cover women's history, African American history, Hispanic history, World War I and the Texas Revolution. Use these to plan your next trip. Now accepting HTC Name & Date Plaque Applications year-round! Historic Texas Cemeteries can apply for HTC Name & Date Plaques or HTC Medallions all year-round. Are you looking for a marker project for your county historical commission (CHC), group, or ogranization? Refinishing faded historical markers is a great way to get out into the community and help preserve the history of your area. THC Marker staff and the Hays CHC hosted a historical marker refinishing workshop to teach the public how to refinish a marker and make it look like new! If you are interested in refinishing markers, please view our written or video instructions on the Refinishing Official Texas Historical Markers page.